As has been noted elsewhere on this blog, my great-great-grandfather Seth Dunham came to California from Maine during the Gold Rush. His parents, James Dunham (b. abt 1788 in Orland, Hancock, Maine) and Elizabeth “Betsy” Gilpatrick (b. 27 May 1795 In Orland) had 10 other children besides Seth. So while I’ve paid much attention to Seth, and to Seth’s grandfather James, it’s time to send out some love to those great-great-granduncles and great-great-grandaunts, Seth’s siblings. James and Betsy’s first child was Abigail, born 4 Jun 1815 in Orland. On 10 Aug 1836 she would marry Leonard Newcomb, a member of a prominent Maine family, and they would live in Carmel, Penobscot Maine and raise four children there. Abigail died in May 1884. Their second child, Nancy, also married well. She wed William P. Worthley in Orland on 30 Sep 1834. They would have 10 children. Othniel was born 19 Feb 1818 in Orland. While Seth would partake in the great adventure of the Gold Rush and Sumner may have also emigrated later to California, Othniel and his younger brother Daniel were caught up in a more tragic national epic: The Civil War. Already a soldier at the age of 21 in 1829 during the quirky Aroostook War, a border conflict between Maine and Canada that never actually resulted in any battle, Othniel enlisted for service in Company I of the Second Maine Regiment on 12 Dec 1861 at the age of 43. Now here’s the odd thing that will require some records from the National Archives: he was discharged a month later, on 18 Jan 1862. No doubt there’s a good story behind this, and I look forward to uncovering it. Amazingly, there is a photograph of Othniel’s regiment. 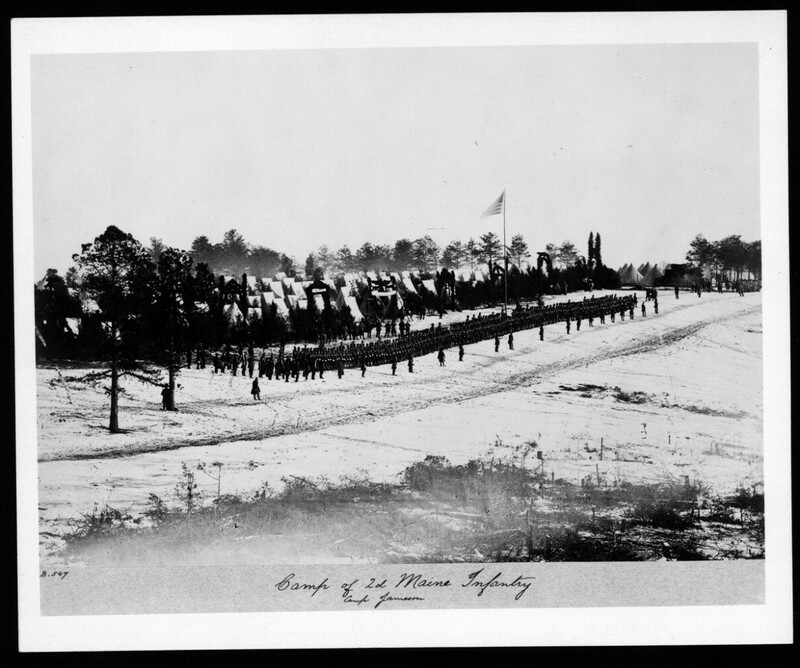 Below is the Second Maine Regiment (1861-1863) encamped on Christmas Day, 1861 at Camp Jameson, Hall’s Hill near Yorktown, Virginia. Despite being in the army only a month, Othniel was a member of the regiment at the time this photograph was made, so somewhere amid this freezing camp is my great-great-granduncle Othniel. Prudence was next after Othniel. She was born 21 Feb 1822 in Orland and died 20 Jul 1903 in Lagrange, Penobscot, Maine. On 24 Jul 1842 she married John Ingalls (1812-1895). If his last name sounds familiar, it is with good reason; he was a cousin of Laura Ingalls Wilder (1867-1957), the author of the popular Little House series of books about life on the American frontier. I’ve detailed that relationship and will post more about that later. Prudence Dunham and John Ingalls had seven children. The fifth child of James and Betsy Dunham was Eli, born 18 Jan 1824 in Orland. He dies in Orland on 13 Nov 1848 at the age of 24. The details of his no doubt tragic death and short life are unknown. Then came Seth, about whom we know much, as I am directly descended from him. Orilla was born 13 Aug 1828 in Orland. About 1855 she married John Studley and in 1856 they had a son, Frank. Nothing more is known about them. Sumner Dunham, born in 1830, was given that odd traditional family name which both my grandfather and great-grandfather were also given. On 29 Aug 1854 he married Lois Anne Lyman (1839-1916). There are no records of Sumner following his brother Seth to the Golden State, but it is likely he did, since three of his four children and his wife lived and died in California’s Central Valley. Seth was only four years older than Sumner; did the older brother’s tales of California bring the younger brother out West, or was it the uncle’s stories that inspired the nieces and nephews? The affection would appear to be mutual; Seth would name one of his sons (my great-grandfather) after his brother. On 12 Aug 1833 Daniel was born. We don’t know much about his family; his wife’s name was Eliza and I’ve found no record of children or when he died. But Daniel lived through some of the most amazing moments of the Civil War. Of my ancestors who served in that conflict, Daniel’s service was probably the most interesting because he was a first-hand witness to the end of the war. On 23 Feb 1865, when he was 31 years old, Daniel enlisted in Company B of Maine’s 20th Infantry Regiment. This regiment was one of the most famous of the Civil War. There are monuments to this regiment at Gettysburg; Daniel joined after that battle, but just in time for the Appomattox Campaign. He fought at White Oak Road, Quaker Road, Boydton Road March, Five Forks, Amelia Court House, High Bridge and on April 9 at Appomattox Court House, Virginia. 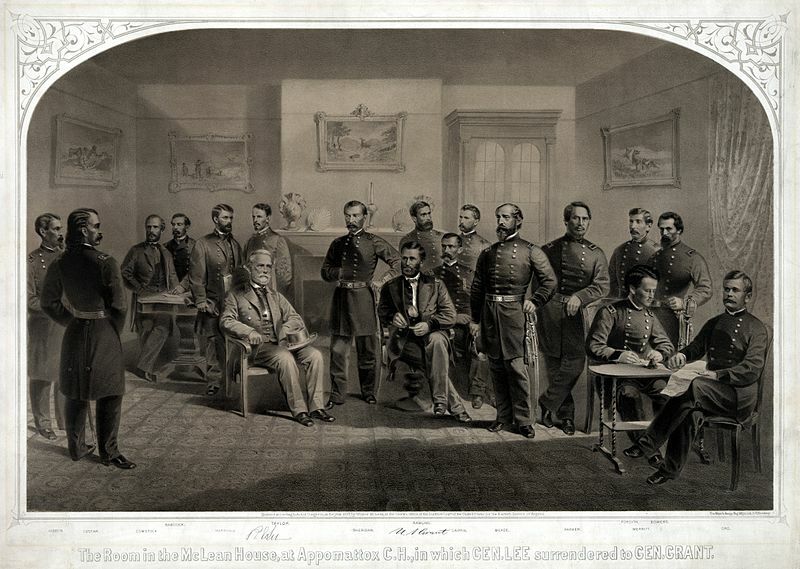 His military records show that Daniel was among the Union troops assigned to receive the formal surrender of General Robert E. Lee and the Army of Northern Virginia on April 9, 1865. One can only imagine what it must have been like to witness that event. 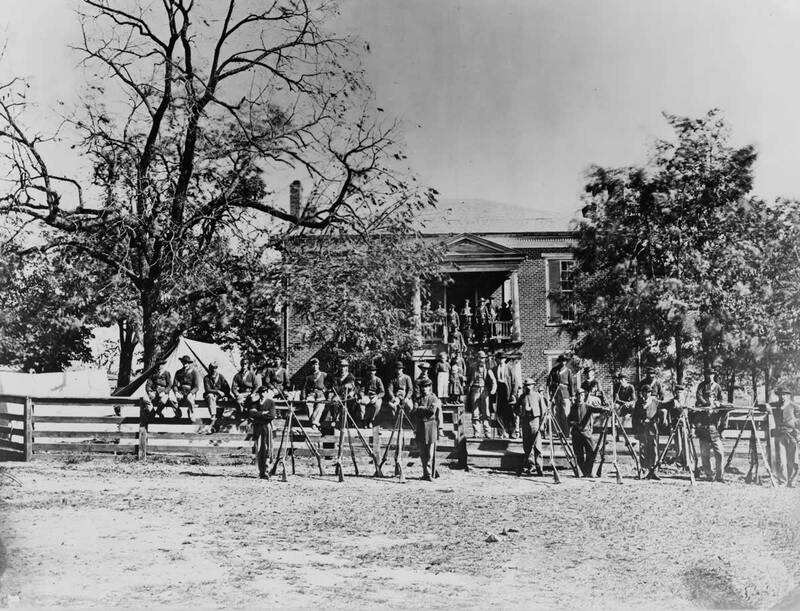 The photograph below is of Union soldiers outside the McLean House, where the Confederate surrender was signed. Daniel could well be one of these soldiers. Imagine how their celebration must have turned to dismay when President Abraham Lincoln was assassinated only five days later. Next, his military record indicates that Daniel Dunham marched from Appomattox Court House to Washington from May 2-12. 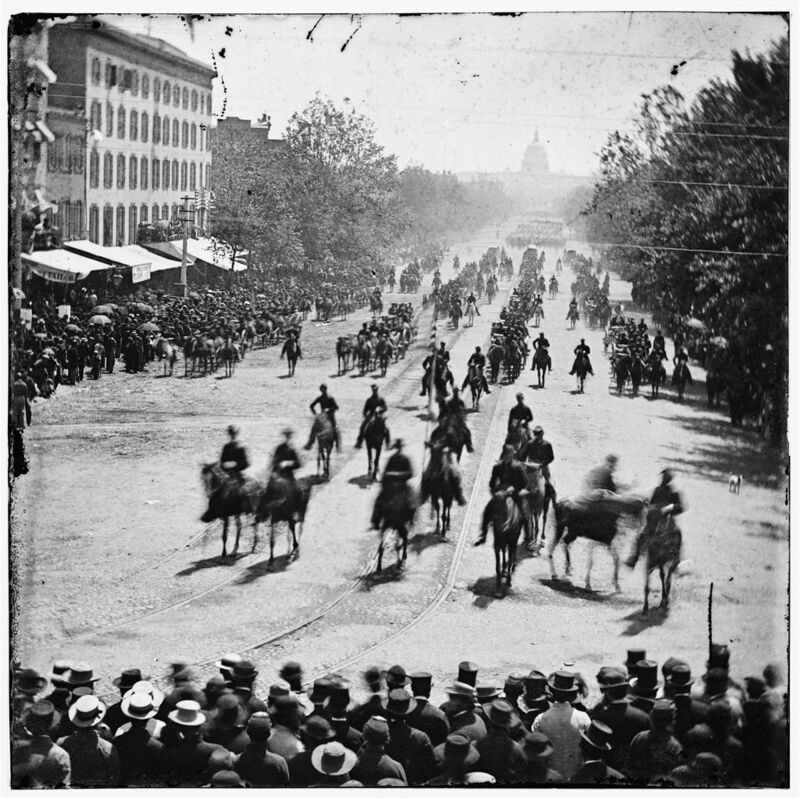 There they were encamped until May 23, when the Grand Review of the Armies was held in the capital to celebrate the end of the Great War, with Daniel marching past President Andrew Johnson and a cheering mob that crowded Washington’s broad avenues and unfinished government buildings. Daniel, a young man from a tiny village in Maine, no doubt would have been amazed at the sights of the young nation’s capital, and to see the new dome of the United States Capitol rising as a sign of hope that he had helped to make possible. He was formally discharged on 6 Jul 1865. We don’t know anything about the youngest Dunham daughter, Maria, born 25 May 1835. The last child, Charles W., was born 15 Oct 1841 in Orland and would die in Ellsworth, Hancock, Maine 15 Nov 1920. We know his wife’s name was Lucy, and beyond that nothing. Despite the gaps in knowledge about the 11 children of James and Betsy Dunham, the veil of history does at times part to give us a glimpse of the Gold Rush, westward migration, the early struggles to set national boundaries, the terrible nightmare of the Civil War, and the eventual victory over slavery. It was with great hardship that my ancestors participated in these vast national experiences. And while I may not be happy with the way the United States invaded and annexed California, I can still be grateful for the contributions of my ancestors in the Gold Rush and the fact that California was never a slave state, a point of pride I can attribute in part to both Dunham and Stoltz veterans of the Civil War. I wish I could have been there with my great-great-granduncle Daniel to see it all end, to watch the Confederate troops hand over their weapons, to glimpse Lee walking out of the McLean House after his unconditional surrender. I wonder how that changed the way Daniel lived his life back in tiny, rural Orland. One can only imagine the stories he had to tell after a day of farming back in Maine. And for the revisionists who wish to glorify the Confederacy this year during the 150th anniversary of the declaration of war on the North by the South, I want to say: You are wrong. It WAS about slavery. The South started the war; it was not “The Great Northern War of Agression.” And by denying that and holding your fancy “Confederate balls” and issuing carefully-worded tributes to traitors, you dishonor the sacrifices made by my ancestors and millions of others to deliver this nation from slavery, pure and simple. Those who try to defend treason, and crimes against humanity, and starving POWs to death at Andersonville as quaint and glorious days, do not justify the South to others; they only drown it in the swamps of history rather than letting its people look to the future.